Little Bird Blue finds a fine wire to settle on and decides it’s a good place to stop. Little Bird Black also thinks the wire is the perfect spot to rest. But Little Bird Blue wants the whole view and Little Bird Black is blocking her view. So begins a battle, first of words then more as each asserts their greater claim to sole occupation of the wire. It’s not until the escalation of tensions has exhausted them both that they decide to compromise and share the perch. Illustrations are watercolour and pencil and depict an idyllic country scene, which is disturbed by the duelling birds! Two Birds on a Wire is a rhyming story about compromise and sharing. Any parent will be familiar with the escalation that can happen with siblings or friends when they feel they ‘own’ something, be it place or thing. The rhyming text keep the tone light, and young readers will be on the side of reasonableness as they watch the two birds compete. Final pages show the pair becoming friends and sharing the wire, more than big enough for them both. Recommended for pre- and early-schoolers. And took it back home. Blossum is hungry and fetches a plum to eat. But her friends are all hungry too and one by one they ask and she lets them nibble and munch on the plum. Dingo comes by too but Blossum isn’t fooled – she knows he’s not really after the plum. By the time Dingo is gone, all Blossum’s friends are feasting on the plum. And in no time there is none left for still-hungry Blossum. Fortunately Grandma comes to visit, bringing a basket of treats. Illustrations are full colour digital and show a softer side of the Australian bush. Good Morning, Possum is a gentle tale of sharing for the very young. It provides the opportunity to explore the notion of sharing and to introduce some of Australia’s bush creatures. Most live in harmony, but there is a reminder that even while sharing, animals need to be wary of predators. There’s also the opportunity to talk about what animals eat. Animal characters are partly anthropomorphised and the rhyming text is full of the eating noises of the different animals. 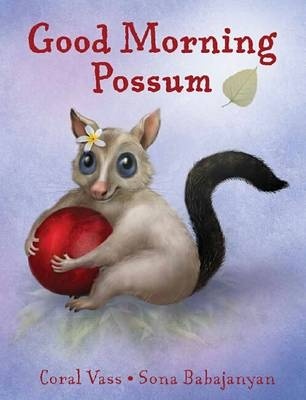 A rhyming text with strong rhythm and repetition, ‘Good Morning Possum’ will encourage young children to predict and contribute to the reading. Recommended for pre-schoolers.